We have decided to do a challenge focused around our Fancy Pants Fashion Sense FELT!! We want to see all of your great projects using ANY of our felt designs!! We have quite a few different colors, designs and styles to choose from-feel free to pick and choose, and also mix and match!! We are excited to see all of the great projects you will come up with!! We look forward to it! The challenge begins NOW and ends at midnight on MARCH 10th! There will be 3 winners who will each receive a fabulous prize package and have their project posted right here on the blog!! Be sure to check out our idea gallery at www.fancypantsdesigns.com/gallery/ for ideas on how to incorporate felt into your projects! We have just returned home from CHA!! It was a great show, and we loved showing all of our great new product!! We wanted to quickly apologize about the delay in announcing the FIVE very luck winners!! I'm sure some of you have been anxiously waiting! :) Each winner will receive a prize pack of our NEWEST paper sets-before they ever hit stores!! Please email megan@fancypantsdesigns.com with your information, so we can get these fabulous prize packages sent out!! Here are some great ideas on how to use so many of our newest products!! 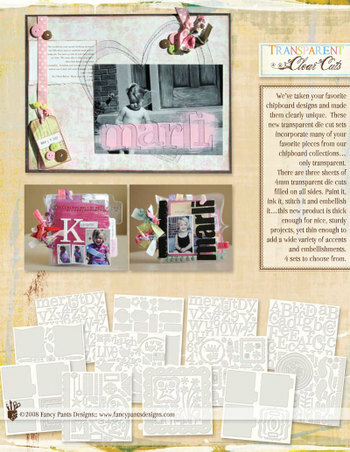 These layouts each use a variety of each our fun new lines!! 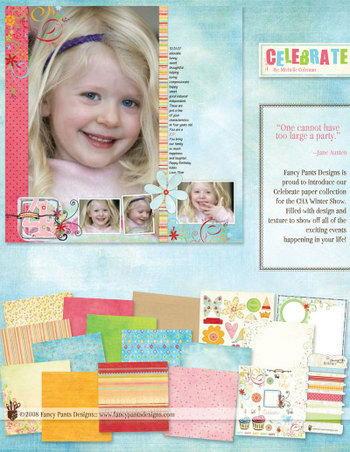 From chipboard and stamps, to glitter cuts and felt.. We hope you will enjoy using these wonderful layouts as inspiration while you are creating all of your fabulous designs with Fancy Pants products!! Just a REMINDER!! Be sure to post comments on our blog for your chance to win one of 5 prize packages of our new paper!! Blog comments must be posted by 12 o'clock, midnight, MST!! Okay...we have so many new items to share for this release, that it has taken us a while to get it all posted :)!! We are going to have these items up on our website and have the official newsletter sent out, so here you go...the rest of our latest products for the CHA Winter show! We are excited to show you our all new Die Cuts...some of our favorite 12x12 chipboard designs (and new ones) in a new medium...TRANSPARENT. This product is sturdy enough for mini books, yet thin enough for many techniques...plain, painted, embellished and even stitched...this product is definitely a new favorite among many!! 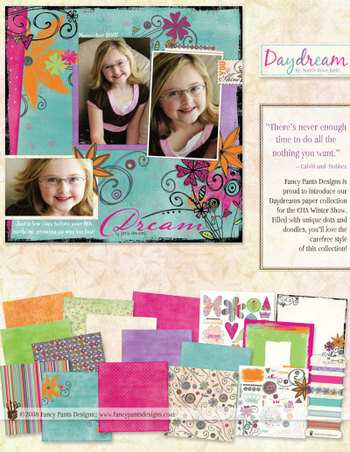 Next, we've got two more collections to share: Daydreams (by nancie) and Celebrate (by michelle)!! And last, but NOT least...we are so excited to premier our first ever Fancy Pants ALBUMS!!! 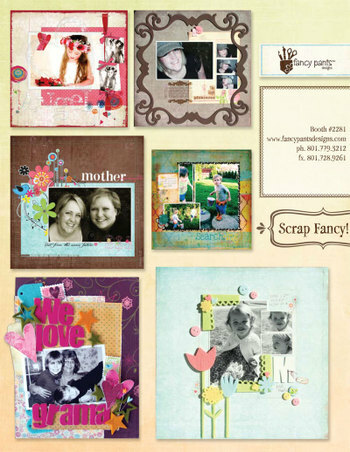 We've designed 4 different albums to meet your needs....each album will fit your 12x12 projects...two of our albums are binder albums with a cool elastic/floral closure...one is a 12x12 gated closure and another 12x12 gated closure that also acts as a 6x12 album...this innovative album opens up to include a binder ring on each spine... you can hold your 6x12 protectors on each side, or you can just use one binder for your 12x12 designs...either way, it works perfectly!! 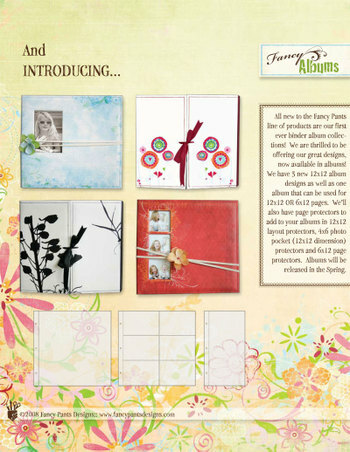 With page protectors to fit 12x12, 6x12 and 4x6 photo pocket pages, these albums will work for a variety of needs!! Now, the albums won't be in stores until May, but everything else you can expect to see in stores shortly after the CHA show...late February or early March...YEAH!! And, because we appreciate all of your kind words and support of our team, we want to give back to you! We're going to send out 5 prize packages of our newest paper sets...post your comments about your favorite new sneak peak from FPD by midnight MST on February 6th and your name will be entered into the drawing!!! The new papers will be sent to you before they ever hit stores!!!! Good Luck and thank you again for your constant support!!! We are excited to release FOUR, yeah thats right, 4! brand new stamp sets! We have two 12x12 sets and two 6x6 sets! First off, we have the 12x12 Create-a-Calendar set. 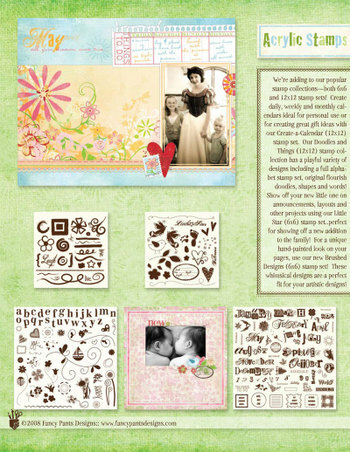 Perfect for daily, weekly, monthly and yearly designs!! It features days of the week, each month and even numbers to create the year! Doodles and Things is our other 12x12 set. This set features lots of shapes and designs, and also a really fun sized alphabet! 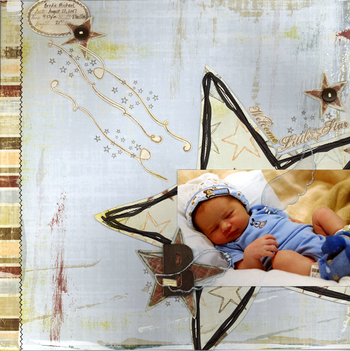 Little Star is one of our 6x6 stamp sets! It is perfect for the little new additions to the family!! It features so many cute stamps! Perfect for those baby layouts! Last, we have Brushed Designs. This 6x6 set is great for those of you that want that fresh hand painted look! See below for releases also posted today! 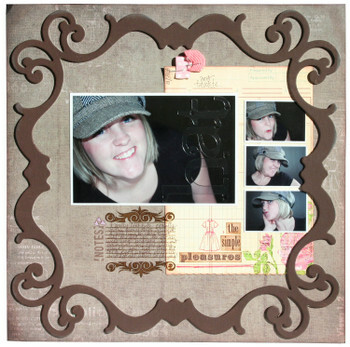 In our release for CHA Winter, we have TWO brand new 12x12 chipboard! 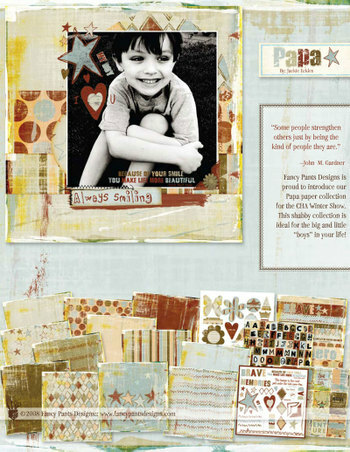 We are so excited to release this special collection created by one of our great designers... Michelle Coleman!! These Glitter Cuts are an innovative twist on full color transparencies! Each design uses unique and detailed artwork, coated with glitter accents and die cut to image the design! 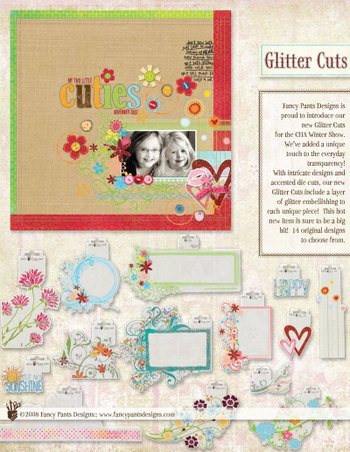 Glitter cuts are a perfect embelishment for any layout! 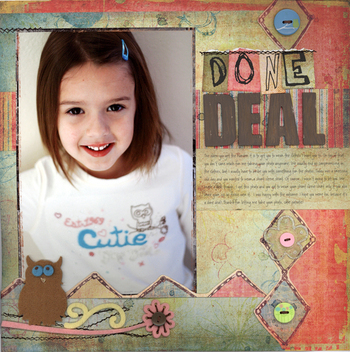 Michelle has created 14 fabulous and genuine designs! We hope you enjoy these great designs as much as we do! Our new felt lines are amazing!!! 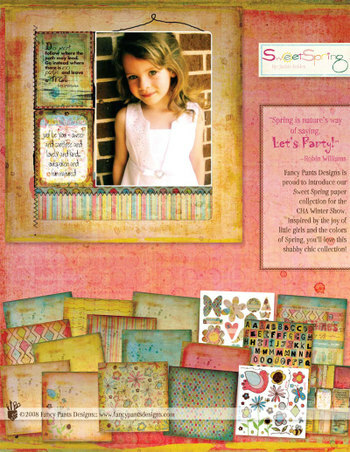 Sweet and Pretty offers soft colors, girlie shapes and designs. From crowns to purses, birdies to butterflies and rainbows, the Fashion Sense line includes buttons and pins for all of your 'Sweet and Pretty' layouts and designs. Rough and Tough...do we need to say more?! This felt offers everything your guy loves! Boats, monkeys, cars and dinos! Once again, the felt has coordinating buttons and pins, perfect for your 'Rough and Tough' needs! These are some of our favorite designs yet!- we hope you enjoy them too! Here we go again... with more great sneak peeks!! These two lines are by a fabulous new designer that we have recently added to our Fancy Pants team! We are so excited to have this great talent added to our team! Welcome JACKIE ECKLES!! We love her different and unique look, and we really think you will enjoy it too!! These great new lines from Jackie have extra paper sets! Each line contains alphas, cards and letters! Be sure to check out the full collection of each of these two lines below. Introducing... PAPA, and SWEET SPRING!